I read a great article in The Guardian online today about an Italian female cyclist named Alfonsina Strada who rode the 3,613 km Giro d’Italia way back in 1924. She’s the only woman who’s ever ridden one of the grand tours alongside the men. Here’s my abridged version of her story. 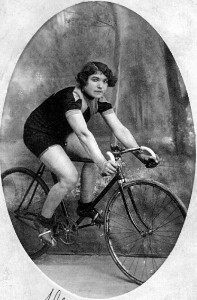 Alfonsina was born in northern Italy in the late 1800s and won her first bike race at the age of 13, winning a live pig. When she was 24 she married Luigi Strada, who give her a new racing bike as a wedding present. The couple moved to Milan, where Alfonsina rode on the velodrome and Luigi acted as her trainer. Her ride in the Giro d’Italia came about through a disagreement between the organiser, Emilio Colombo and the top riders of the day. The riders refused to take part so Colombo offered places to whoever wanted to ride. Gazzetta dello Sport promised to pay their bills, their hotels and their food. It offered places for 90 riders and promised 600 chickens, 750 kg of other meat, 4,800 bananas and 720 eggs. But there would be no managers, no masseurs, no mechanics and no team cars. Alfonsina entered as “Strada, Alfonsin.” The absence of a final “o” or “a” to her first name hid whether she was a man or a woman. She was accepted as number 72 and, assuming her to be a man, journalists began writing of Alfonsino. The truth emerged the day before the start and by then it was too late. She came 74th on the first day, an hour behind the leader but nothing by the standard of the day, when riders could be separated by hours. She finished 50th of 65 between Genoa and Florence and survived as far as Naples. Then the weather turned. A gale blew, rain poured, mud and rocks swept across the road. Alfonsina was among many who crashed. Her handlebars snapped and she stood by the roadside until a peasant snapped a broomstick to jam in the hole. She rode on with one side of her bars of steel and the other of broomstick but finished outside the time limit. The race referees excluded her because she was out of time. The organiser, Colombo, couldn’t stop them from applying his own rules but by then spectators were waiting to see her and her rides were producing stories for his reporters. He let her ride on as an individual, paying her bills but excluding her from prizes. The next day was to Fiume, where a crowd lifted her from her bicycle and carried her in triumph when she finished in tears from pain and exhaustion 25 minutes after the time limit. It motivated her to continue to Milan. Only 38 completed the race and Strada, although no longer formally in the running, finished more than 20 hours ahead of the rider who finished last. She finished 28 hours behind the winner, 30-year-old Giuseppe Enrici. But almost an hour separated Enrici from his runner-up, so it was hardly a close-run race. And two riders finished behind her. She won 50,000 lire. A real trailblazer for female cycling. She went on to continue competing in bike races but not in any future grand tours because they rules were changed to exclude women. And if you’re wondering…… she rode a single speed bike which would have been made of steel, nothing like the modern multi-geared super light carbon bikes were all race on in the modern era. One tough lady. You can read a longer version from the Guardian by Suze Clemitson here. Thanks for sharing the clif note version of the story! That’s an amazing accomplishment!